This study is a pilot Randomized Controlled Trial (RCT) that compares the effectiveness of a Cognitively-Based Compassion Training (CBCT) group treatment to a support group in reducing depressive symptoms and suicidal ideation and increasing self-compassion and mindfulness in low-income African Americans who had attempted suicide (n = 82). After completing several measures, including the Beck Scale for Suicide Ideation (BSS), Beck Depression Inventory—II (BDI-II), Self-Compassion Scale (SCS), and Five Facet Mindfulness Questionnaire (FFMQ), participants were assigned randomly to attend either a 6-session CBCT group or a 6-session support group. Although following intervention participants randomized to both groups had comparable reductions in levels of depressive symptoms and suicidal ideation and no significant changes in their levels of mindfulness, improvements in levels of self-compassion were found only for those receiving the CBCT intervention. 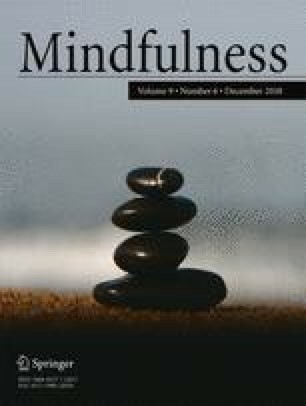 In addition, for individuals in the CBCT group but not in the support group, the degree of improvement in self-compassion predicted the level of reduction in depressive symptoms and suicidal ideation and the degree of improvement in mindfulness predicted the level of reduction in depressive symptoms. Taken together, the results indicate that CBCT is potentially valuable for this population and its emphasis on self-compassion and mindfulness is associated with improved psychological functioning. DL performed all data analyses and wrote the majority of the manuscript and made all requested edits from the editorial board. SAM coordinated a portion of data collection, wrote part of the “Methods” section of the manuscript, and provided proofreading and edits. BP trained study therapists and conducted group therapy sessions and provided information used in crafting parts of the “Methods” section. LTN was a primary developer of CBCT and approved the manuscript. NJK is the primary investigator on the project and provided detailed editing and feedback on the manuscript. This research was supported by grants from the Emory University Research Council (Group interventions for Suicidal African American men and women) awarded to the last author. All procedures performed in studies involving human participants were in accordance with the ethical standards of the institutional and/or national research committee and with the 1964 Helsinki declaration and its later amendments or comparable ethical standards. The Emory University IRB provided approval for this study. Desbordes, G., Negi, L. T., Pace, T. W. W., Wallace, B. A., Raison, C. L., & Schwartz, E. L. (2012). Effects of mindful-attention and compassion meditation training on amygdala response to emotional stimuli in an ordinary, non-meditative state. Frontiers in Human Neuroscience, 6. https://doi.org/10.3389/fnhum.2012.00292. Pepping, C. A., Lyons, A., McNair, R. P., Kirby, J. N., Petrocchi, N., & Gilbert, P. (2017). A tailored compassion-focused therapy program for sexual minority young adults with depressive symptomatology: study protocol for randomized controlled trial. BMC Psychology, 5. https://doi.org/10.1186/s40359-017-0175-2. Zhang, H., Watson-Singleton, N. N., Pollard, S. E., Pittman, D. M., Lamis, D. A., Fischer, N. L., et al. (2017). Self-criticism and depressive symptoms: mediating role of self-compassion. Omega-Journal of Death and Dying. https://doi.org/10.1177/0030222817729609.